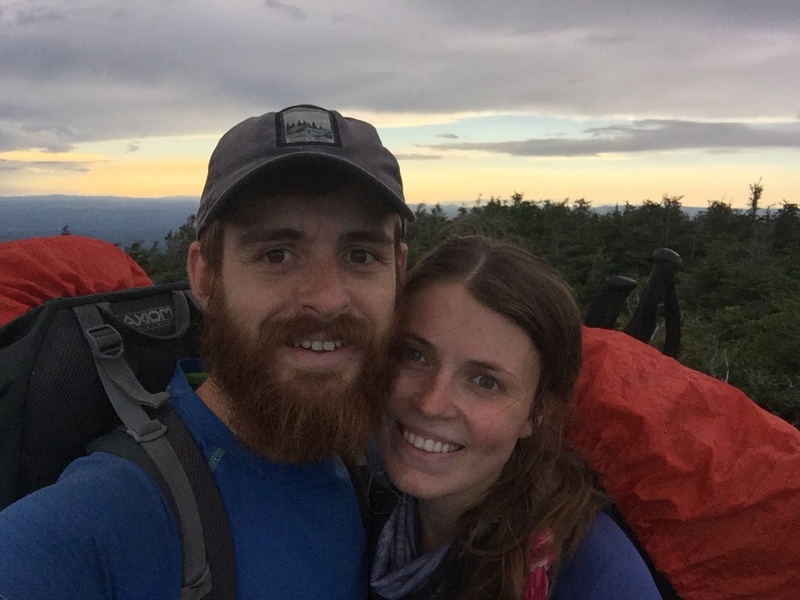 After 1,800 miles you’d think we’d have this thing figured out, but the Appalachian Trail is fighting back, right as the finish line starts to loom. 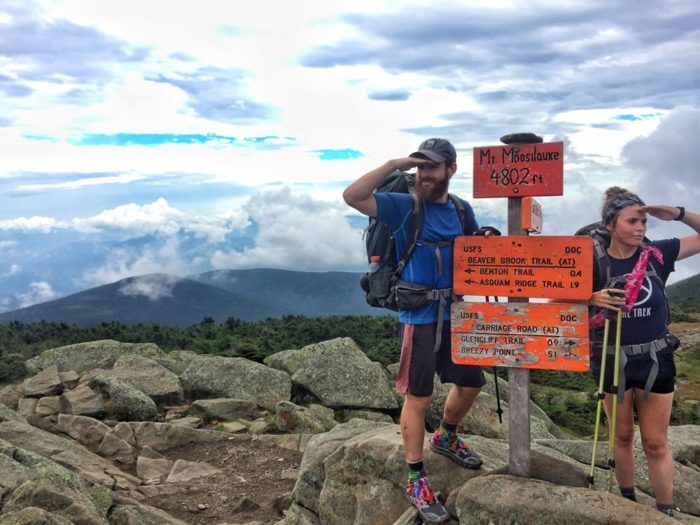 What counts as the home straight on the AT? The final month? The final state? The final 100 miles? Whatever it is in the context of a 2,190-mile, 14-state hike, it’s starting to feel like we might just about be there. 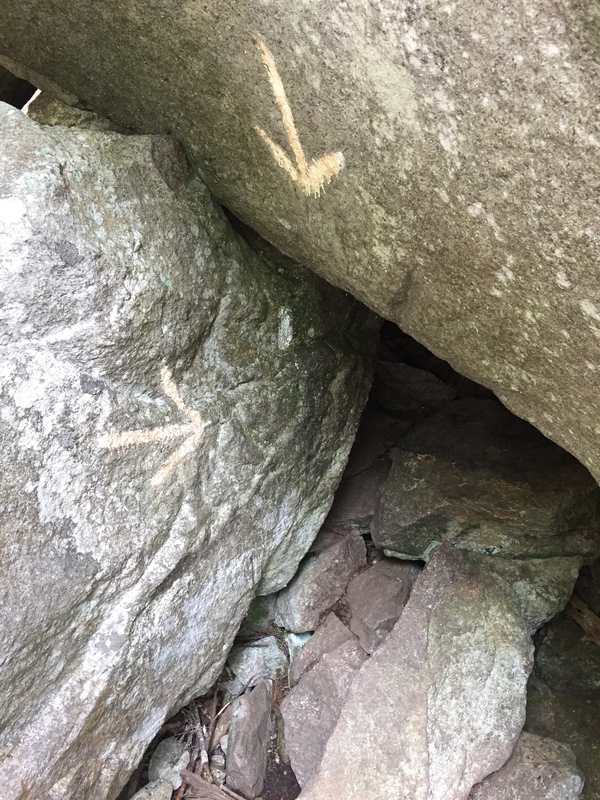 The trail clearly knows it, though, and seems determined to make us earn our stripes. Since we entered the White Mountains the terrain and the difficulty has multiplied many times over. The good news is we knew it was coming. Unsurprisingly, when you’re approaching a big challenge on the the trail, it’s all anyone is talking about. At shelters each night, at hostels, any time you pass a southbounder who’s been where you’re going, the talk is about what’s ahead and what it’s going to be like. So we knew we wouldn’t be making the 20-mile days that were so typical before New Hampshire and were expecting to be hitting the 13- to 15-mile mark through the Whites and into Maine. We’ve walked a long way over tough terrain; we can do 15 miles a day, right? Wrong. Just so very wrong. 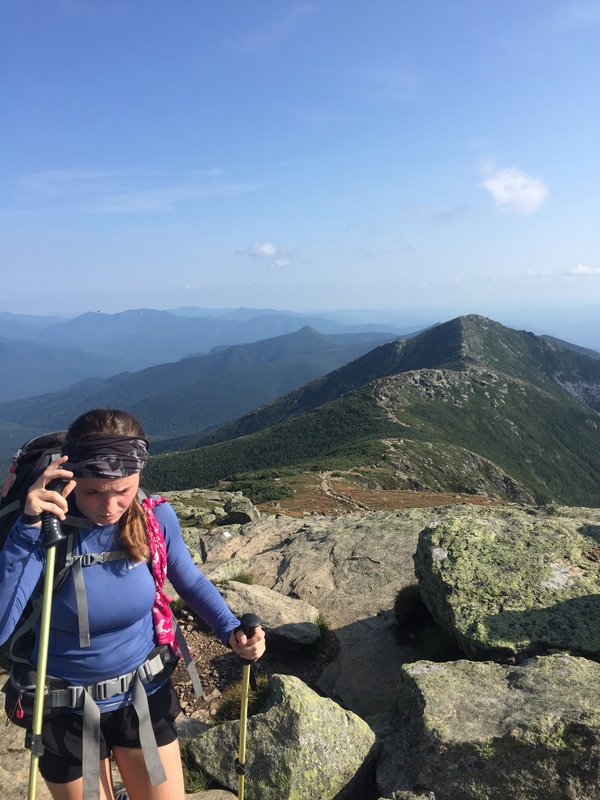 On day one of the Whites all we plan to do is climb over Mount Moosilauke. It’s around eight miles from bottom to top and down to the bottom on the other side, but it’s well known for being a tough climb and a seriously tough descent down the north face, so setting aside a day for it seems like a good idea. The climb up the south side is encouragingly simple. For all the talk about how hard the mountain is, we just put our heads down and grind our way up. At the top there’s around a mile of mountain that’s above treeline, maybe slightly less. From checking the weather report in the morning, we’re expecting rain and thunderstorms to hit in the afternoon and I’m very keen for us to get up and over this thing before all that starts. 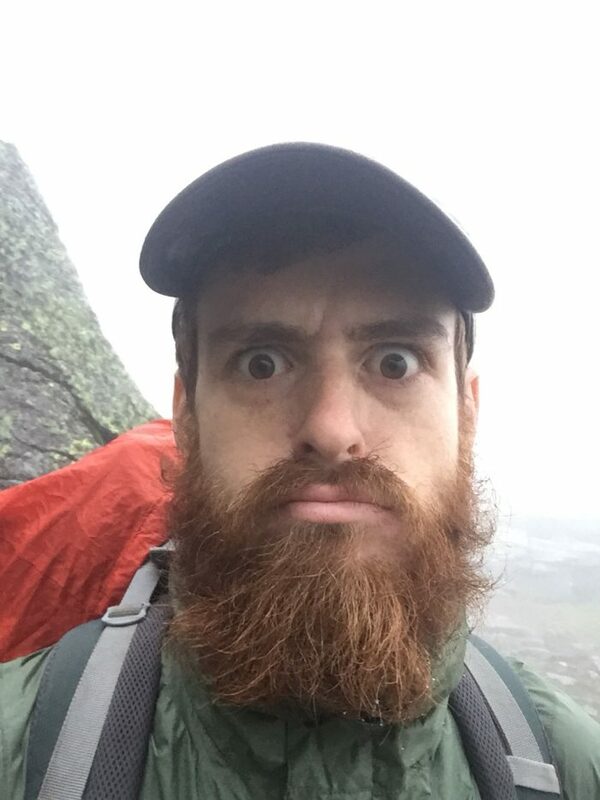 We’ve hiked through lightning before and I have absolutely zero desire for Robin and me to be on top of an exposed mountaintop when a thunderstorm sets in. The going is good and we make it up before the weather starts. Mount Moosilauke, the first peak of the Whites. Job done for the day, we shuttle into the town of Lincoln, where we resupply and spend the night at Chet’s. Chet’s a local who runs a donations-based hostel in town, letting people sleep in his garage and basement. We score a space on the floor in the basement along with four other hikers: Smiles & Honey Badger, Wanderer, and Earth Heart. In the morning the bad weather is continuing and many are considering a zero. It’s been raining nonstop since the early hours and isn’t forecast to stop until the afternoon. With our visa clock ticking ever louder, we can’t afford a day off so pack up and head off (via a McDonald’s breakfast). 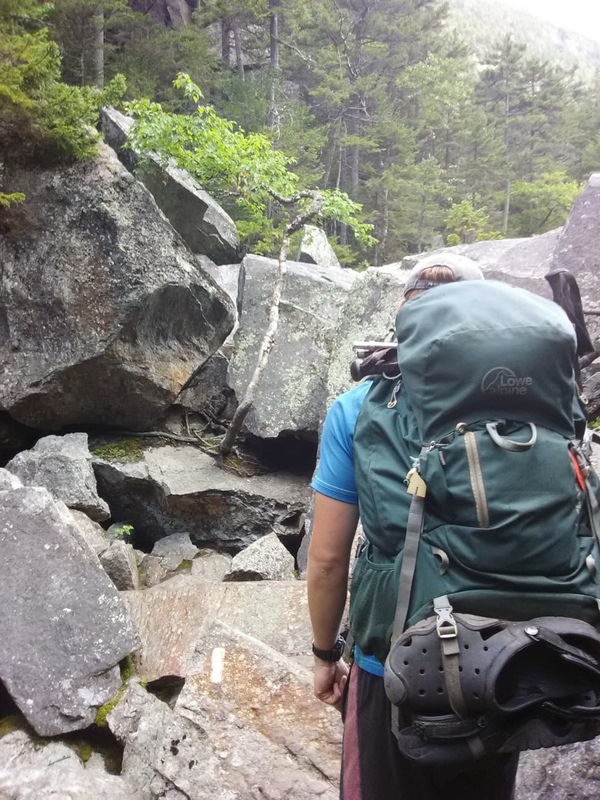 When we reach Kinsman Notch, the point we left the trail the day before, we find the parents of a current hiker spending the morning providing some trail magic. They’re cooking breakfast under a gazebo and it looks like a great place to avoid the downpour. We have second breakfast and the moment we leave them the rain stops. It’s like a miracle! That never happens! We begin our hiking for the day with a flooded trail but no more rain falling. The day is, again, slow. 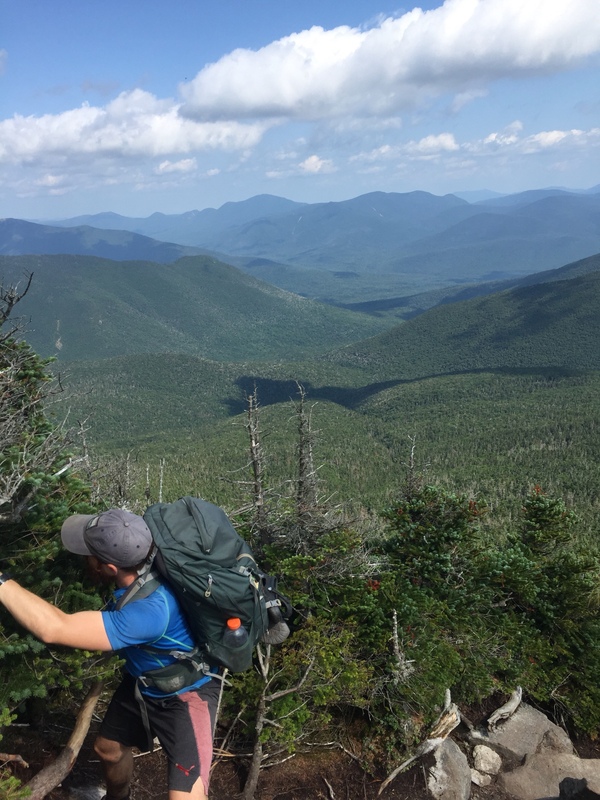 The terrain is rocky, wet, muddy, and steep and the day ends with the climb over Kinsman. It’s a 2.5-mile climb to the top and, like fools, we’re looking forward to it. After a slow morning of rocky ups and downs it’ll be nice to just get a consistent climb we can grind out like the day before and make some good time over. The reality, though, is different. This time, instead of climbing down, we’re rock climbing up. Forever. It’s particularly tough on Robin, who at 5 foot 4 is frequently having to bring her knee up over 90 degrees to climb up a rock. Eventually, though, we make it to the top, just in time for sunset. When we reach our campsite, we’re exhausted and we’ve only done an 11.6 mile day. 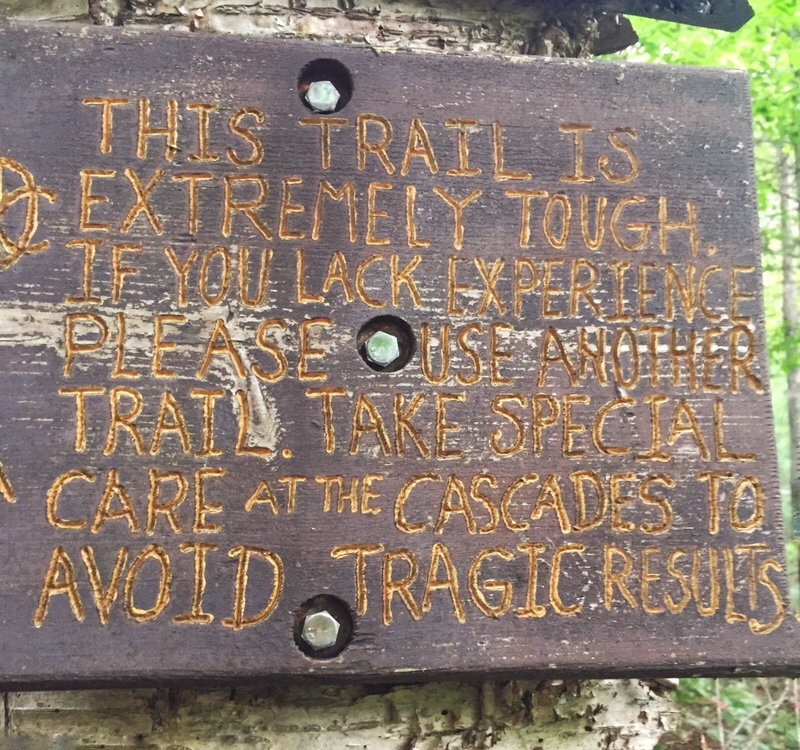 If the rest of the trail is like then we’re in for a tough ride. It’s a bit of a wakeup call about the Whites, so we start getting up earlier so we can hike for more hours each day. From here on out we’re up at half 5, hiking from half 6. 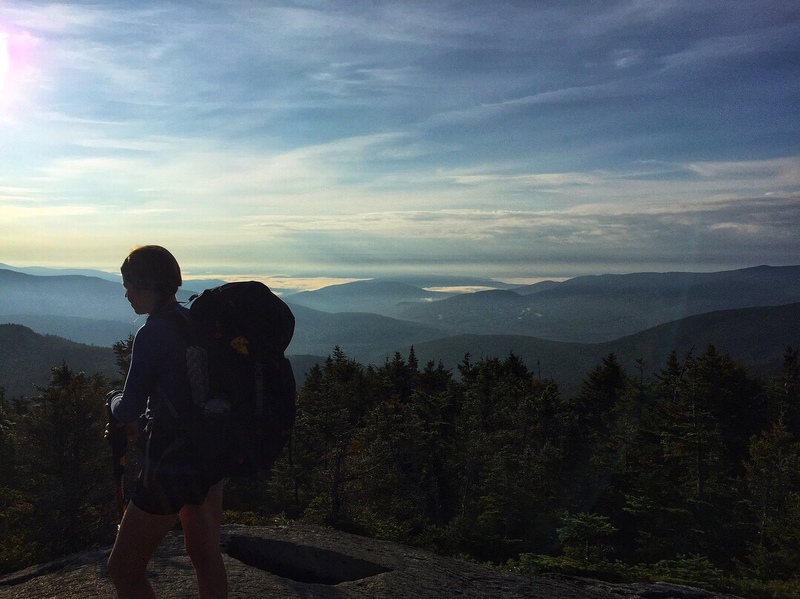 The next day holds what will probably be one of our standout Appalachian Trail memories. 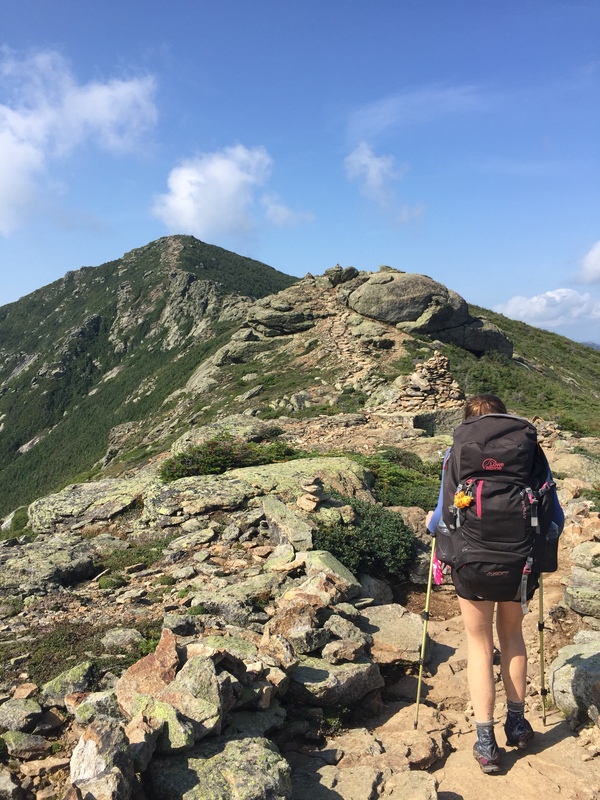 After a long climb we make it up to Franconia Ridge and it’s spectacularly beautiful. In one ridgeline and one set of views it makes all the hard work climbing mountains worth it. The pictures just don’t do it justice. At around 7 that night we find a spot to camp. We’re exhausted and we’re still 2.5 miles away from where we’re supposed to be. The day was supposed to be 15 miles and we haven’t even achieved that, after setting out at half 6 that morning. Man, the Whites are hard. My best game face. I know, I’m a yellow Macintosh off being a crazy fisherman. The wind speeds up and the rain crashes down as we scramble across wet, loose rocks trying to keep our footing. In the fog we find Baba Ganoush and Red Stripe (the hikers, not the dip and lager, although what a find that would have been). They’re having an equally difficult time so we band up and make our way to Madison Hut as a four. I take the lead and Baba Ganoush takes the rear. Between us we make sure we never lose sight of each other in the fog and that we keep Robin and Red Stripe between us as we struggle from barely visible cairn to barely visible cairn. The wind is phenomenal. I’ve never experienced anything like it and I hope I never do again. It drives the rain down like daggers to the eyes and even Baba Ganoush (at probably 6 foot 3) is struggling to keep his footing, so Robin and Red Stripe, both slight in build, are having a very rough time. The gusts are so strong that when they hit all we can do is stand still and brace against it, waiting for it to pass and the “normal” crazy wind speed to come back. It’s about five miles from the top of Washington to the hut and when we get there it is not a moment too soon. Mercifully, the weather starts to let up and a day later, following a 21-mile slackpack from Rattle River Hostel we’re out of the Whites. Finally, after all this time, we’ve reached Maine. Thirteen states behind us, just this one left. If we were expecting some respite from the Whites, though, we’re not going to get it. 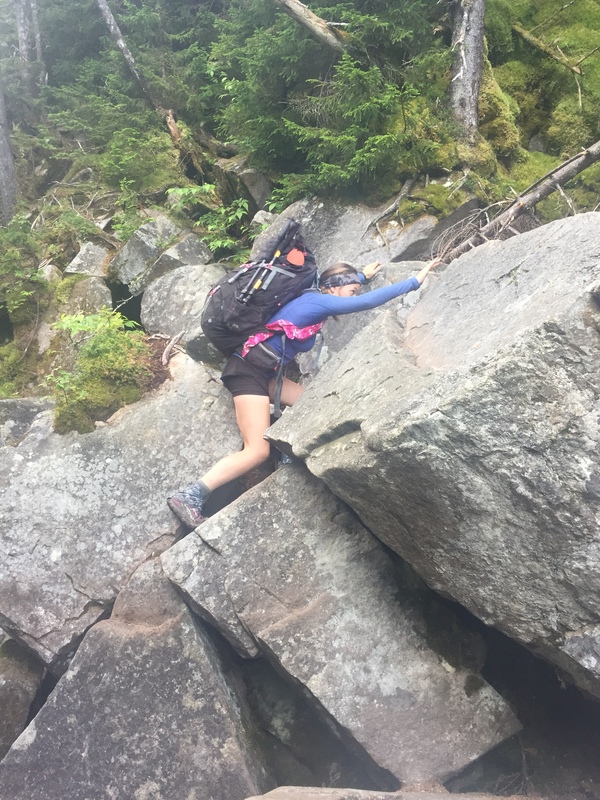 So far Maine has been one rocky, steep scramble after another and our pace has been painfully slow. Again, we are not achieving the miles we hope to each day. The full-body experience continues and now, after 1,900 miles, we’ve both reached the point of near-complete exhaustion and fatigue. Our bodies are drained. Not from the hiking, because we don’t seem to do any of that anymore, but from the rock climbing, tree-clinging, and bum shuffling that we’ve been forced into. To describe the path through Maine as “trail” that one could “hike” would be to mislead the reader. 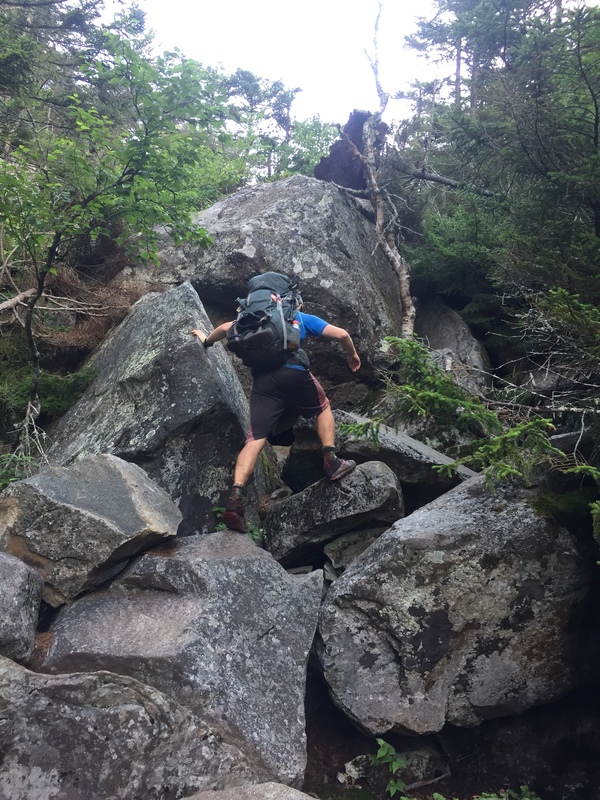 Instead, it’s a collection of scattered rocks, boulders, and tree roots that loosely define a route to a large mountain called Katahdin. Or at least it is so far. Before New Hampshire and Maine we couldn’t wrap our heads around how people couple drop out at this point. We’re so close to the end now, surely anyone could drag themselves these last few hundred miles? Now we get it. The physicality of covering this terrain with a pack on your back is exhausting and attritional on your body. The mental strength to keep going is hard to muster. Thankfully we have each other and when one of us is down the other can encourage us to keep going. 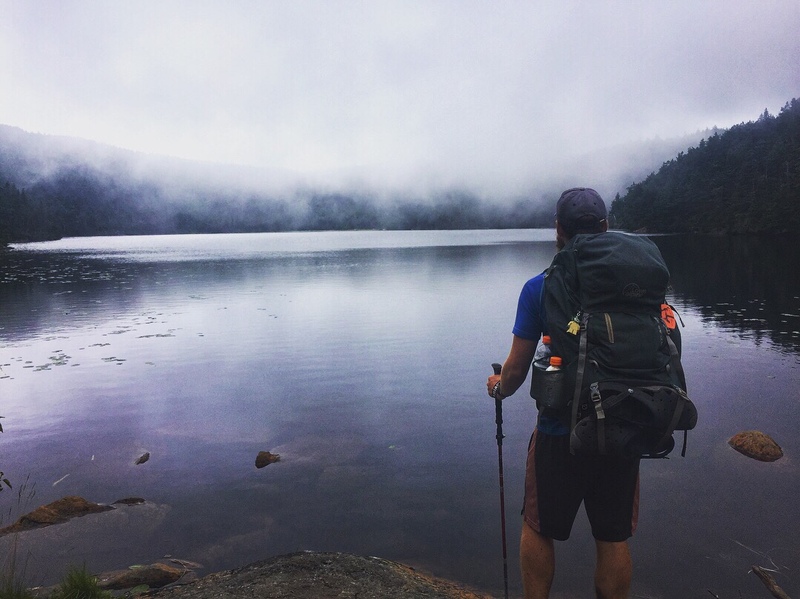 How solo hikers do it is nothing short of inspirational. Oh. My. Goodnes. Gracious. Me. I have never been so mentally and physically exhausted in my life. The Whites and our experience of Maine so far has been a full body onslaught that has knocked me for six (a nice wee British cricket reference for you there). My whole body is tired and my legs haven’t been this cut and bruised since I was nine and out galavanting in the woods as a girl. I kinda thought I was an established hiker until we hit the Whites, and boy was I wrong. I feel like we’ve got to the boss level at the end of a video game and no matter how hard we try he just won’t die. With every scramble, rock slide, and precipice I grow more and more thankful that I have Buck and that he loves me enough to support me through. The countless times he’s waited back for me to pull me up a steep rock face or show me the safest way across (not always having been lucky enough to take it himself) I couldn’t have got this far without him. 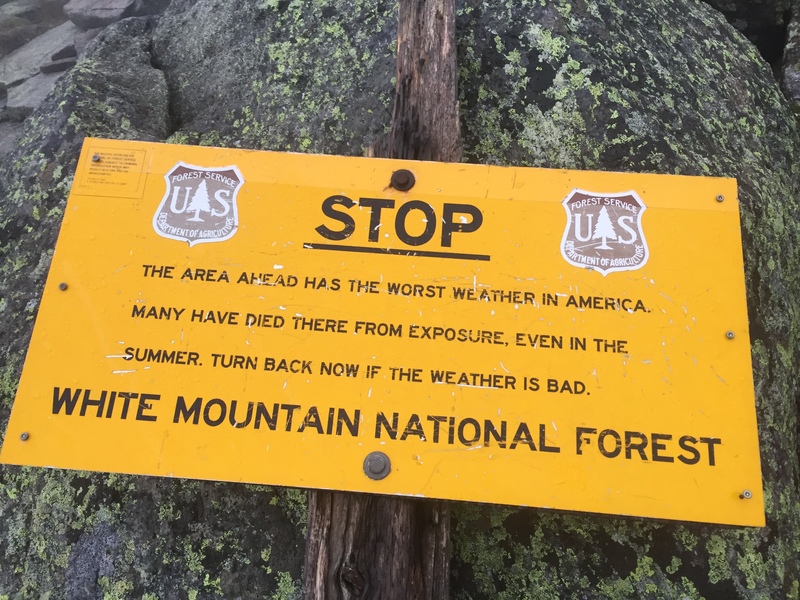 Let’s not even get started on the descent down Washington – I was an emotional wreck! Well written. Have enjoyed your thoughts immensely. Charlie Mike. Fair winds and following seas. We met Wanderer on Whiteop Mtn in May as we were doing a SOBO section hike. We only chatted for a few minutes, about water sources and the Guthook app, but we have remembered him and been praying for him. I am so glad to see he is well on the way to finishing his journey.